Thursday is guest post day here at Duct Tape Marketing and today’s guest is Emeric Ernoult – Enjoy! Feeling a bit lost with your Facebook Page insights? Good. Facebook Insights terminology (https://www.facebook.com/help/336143376466063/) was not built for humans, and now that we know you are not a killer robot from Mars, we’ll help you measure your Facebook Page’s performance without drowning in all that robotic Martian muck. What can be measured can be managed (and improved). These are the first six key metrics non-robots must track to understand Facebook Page performance, why you need them and where to find them. Fan Reach simply shows the number of your page’s fans (clicked your page’s ‘like’ button) who have seen any given post. The fan reach metric is not available in the Facebook statistics interface; that would be way too easy for hard working marketers like us, right? It’s only available in an Excel file available for download. 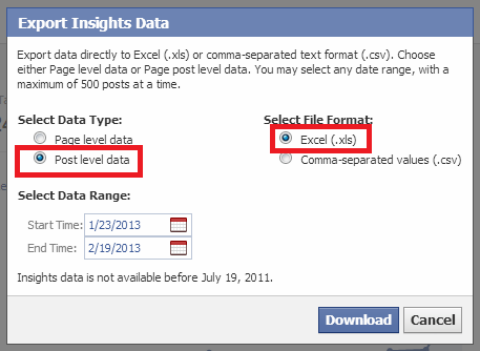 To access fan reach data, you first need to export post level data to Excel. Choose the format, the date range and select “post level data. Within the Key Metrics tab, look for the column labeled “Lifetime Post reach by people who like your Page. Important– Fan Reach is a part of “organic” reach, so it only records the views that occurred directly (newsfeed or on your page), and not through the action of a friend (share, like, comment). Per-post fan reach helps you measure the quality of your audience and the appeal of your content to them. If you bought thousands of fans from a website, or sponsored a contest with an eye-catching prize unrelated to your brand , many of these uninterested ‘fans’ have probably unsubscribed from viewing your posts. If they haven’t, Facebook’s EdgeRank feature will effectively do this for them, and this can severely disrupt your ability to reach your real fans. Publishing interesting and valuable content to a genuine audience is the best way to ensure your message is worth the effort. Start gauging your efforts and your page’s health with Fan Reach. Good news humans! This one is simple! And, it’s much easier to find! Organic Reach simply adds views from users who have not liked your page to Fan Reach (direct views of a given post on the newsfeed or on your page). Just go to your Insights, scroll down to your list of posts, click on the Reach number for each post and hover your mouse on the bar chart for “Organic”. This metric will also appear under each post if you’re logged into your Page. From the Insights interface, click on the number of people reached for the post in question and hover your mouse over the “Organic” bar chart. So, if you don’t want to go through the hassle of downloading an Excel file to get your fan reach, you can check your organic reach metrics much more easily. Just keep in mind there’s an important difference between the two. 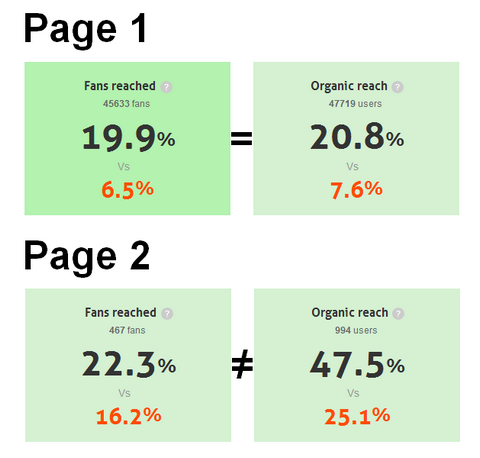 The example below shows the differences between Fan Reach and Organic Reach on two compared pages. Fan Reach and Organic Reach can vary significantly from one Page to another. These figures are extracted from the Agorapulse Facebook Page Barometer (http://barometer.agorapulse.com/). Before relying solely on organic reach, check to see if there’s a big difference between these two metrics on your Page. If Organic Reach is very close to Fan Reach, it usually means that people cannot be exposed to your content if they are not already fans. So, try promoting your page on other channels. Efforts made on your website, blog, or newsletter can significantly increase your organic post views. So, liking, commenting, liking a comment, sharing, viewing a video, clicking on your links and photos, clicking on a commenter’s name, clicking on your page name, hiding, or reporting you as spam, from anywhere, all qualify. Reach tells you how many people have potentially seen your content; engagement is the number of people who have interacted with your content. Luckily, this is another one that is pretty easy for us human types to find. To see number of people who engaged with your content for each post, look for the “Engaged Users” column within your Insights (close to where you found your organic reach). 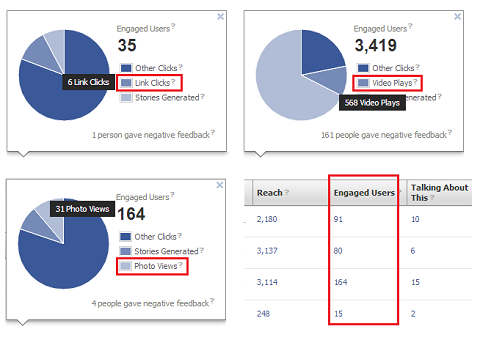 The Engaged Users metric is easy to see on your Facebook Insights page. While a lot of views can be great, successful Facebook marketing depends on making sure the content you offer your audience triggers some kind of interest. 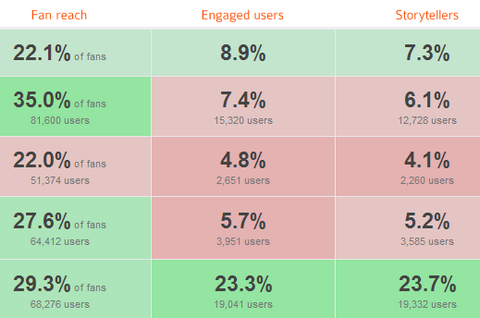 This is how your engagement metrics will help you sharpen your message. Raw numbers can be misleading, though. If you rely solely on the number of engaged users, you’ll never know if good engagement on a specific post is due to the quality of your content, or if it was simply shown to more people. 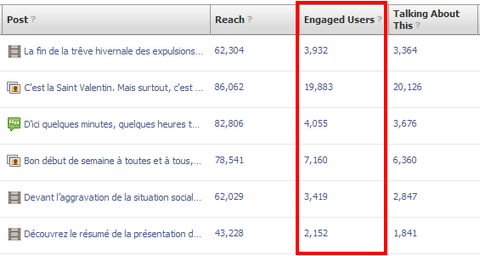 So, always compare the number of users reached with the number of users who engaged for each post. 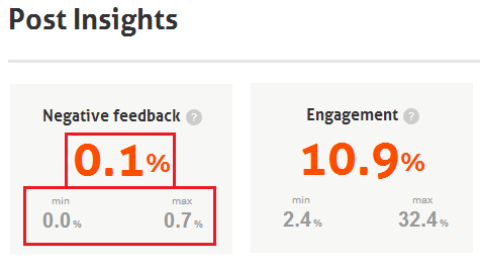 Now, compare your post engagement metrics with your other posts by creating a percentage. Use this formula for each post to compare one post’s performance against another. This formula will give you a percentage that takes the exposure of each post into account while allowing for comparison between posts. Percentages help benchmark posts against each another. This screenshot is extracted from the content performance heatmap of the Agorapulse Statistics feature (http://www.agorapulse.com/features/facebook-statistics). This is one of Facebook’s least understood metrics. Partially due to it’s dual label. “People Talking About This” data in Facebook Insights is also referred to as “Storytellers” in many different places, including the Excel download. The “people talking about this” metric only measures three types of actions: likes, comments or shares. These actions are already included in the wider array of your Engagement metrics, PTAT (as the robots call it 😉 just narrows it down a bit more by highlighting the number of engaged users who showed their engagement with you to their friends. So, back to your Insights interface where you found your organic reach and engagement stats, and look at the “Talking About This” column. Way too easy. Click on the “People Talking About This” number for each post to see a breakdown of the action taken on each post. The “people talking about this” metric is essential for measuring how many people are willing to spread the word about you to their friends. It’s the “viral” metric, touching on one of your primary motivations for creating a Facebook Page- connecting with the friends of your existing fans for free! Facebook is evolving, and has been limiting the reach of these stories since mid 2012, so don’t expect too much from this metric. Virality is still a reality on Facebook, but it is not the viral Eldorado it used to be in the early days. Ok, you know this one. CTR has been measuring the effectiveness of email marketing, banner advertising, landing page quality, and search engine ads such as Adwords campaigns since… yeah. Nothing’s changed here. Click-through rates tell you the number of people who have clicked on a link in your content, watched your video or viewed a larger version of your photo. I like to think of CTR as the ‘Really Really Engaged’ metric. Click on the Engaged Users number within you rPage Insights interface, and you’ll find your CTR. If the content is a link, it will be named “Link Clicks;” if it is a video, it will be labeled “Video Plays;” if it is a photo, it’ll read “Photo Views.” Pretty straightforward. Thank you, killer robots. The click-through metric is at the bottom of your content quality funnel. Keep a close eye on it. Some people just don’t like your content showing up in their newsfeed. When they take an action by hiding your post, hiding all of your posts, or reporting you as spam, this is called Negative Feedback. Click on the Engaged Users number in your Page Insights to see the number of users who gave negative feedback at the bottom of that window. You’ll have to download the Excel export as mentioned in the fan reach section above to get a breakdown. Click on the Engaged Users number for each post and you’ll see the “negative feedback” number in small print. Facebook has given more weight to the negative feedback metric since September, 2012. Posts with a high negative feedback number will have much less exposure through EdgeRank and Pages with an average negative feedback that remains high will see their overall reach decay over time. Again, the raw digits fed to us by Martians can be tricky. This is where so many marketers go wrong. You can’t see the truth behind your page’s negative feedback without taking exposure into account. So, never rely solely on the number you see on your Insights dashboard. Always compare the number of users reached with the number of users who gave negative feedback before judging the quality of each post. Then, create a percentage score of this comparison to compare results from different posts. Looking back at negative feedback in percentages, I’ve found the average negative feedback is 0.1% of the users reached, but some Pages go as high as 0.7%! Use percentages when analyzing your negative feedback and engagement scores. These averages are extracted from the Agorapulse Facebook Page Barometer (http://barometer.agorapulse.com/). Once you’re solid in understanding this data and analyzing it in the most productive way, you may want to use third-party tools to save time. There are many. You may also decide to invest in paid tools such as Agorapulse (http://www.agorapulse.com/) Quintly (http://www.quintly.com/) or Wisemetrics (http://wisemetrics.com). Your turn! What metrics are you paying attention to and why? Do you analyze your data directly on Facebook or do you use a tool? Please leave your comments and questions below. Emeric Ernoult is the founder of AgoraPulse (www.agorapulse.com), a Facebook Marketing Technology that has been featured on AllFacebook as the “Low Cost Facebook CRM alternative”. AgoraPulse is currently being used by more than 10,000 brands and agencies across 57 countries. Clients include McDonald’s, Playstation, Microsoft, Fiat, Mini, and dozens of leading Digital & Social Media Agencies). 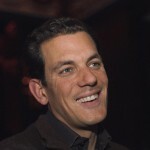 Emeric is a regular speaker at International conferences such as the AllFAcebook Marketing Conference, Social media Examiner Facebook Success Summit and Facebook Marketing Conference (London), iStrategy, Digital Paris and eMarketing Paris.